Bake the chicken according to the directions on the package. While the chicken cooks, arrange the salad greens on 2 plates and fan out the pear wedges. Slice the chicken into ¼ inch slices and arrange over salad greens. 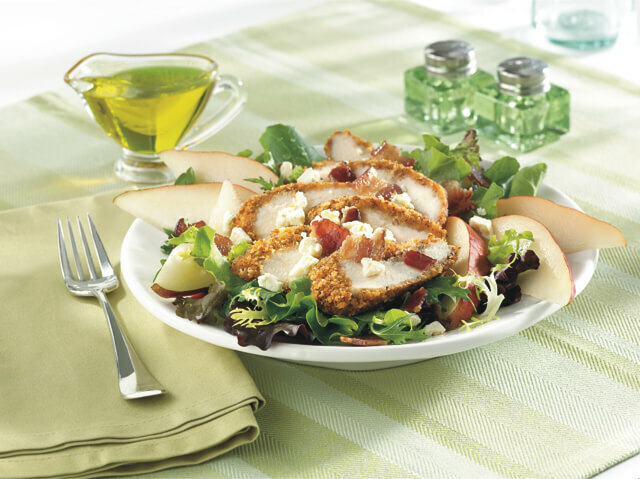 Sprinkle bleu cheese and bacon over the chicken and drizzle with your favorite salad dressing. When pears aren’t in season, try some other fruits, like red grapes, apples, strawberry halves or cantaloupe cubes.